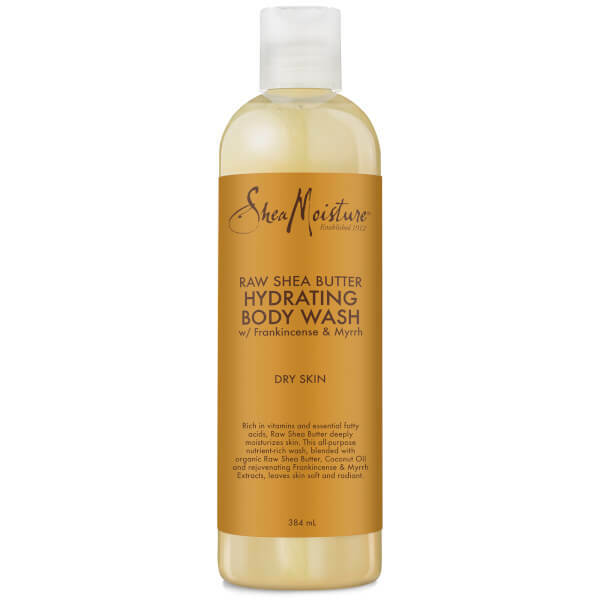 Nourish your skin with Shea Moisture Raw Shea Butter Hydrating Body Wash, a nutrient-rich treatment that cares for even sensitive skin. Enriched with key ingredient Shea Butter to replenish essential moisture deep below the dermal level, the fragrant shower gel uses Frankincense and Myrrh extracts to balance and brighten the skin tone whilst lessening the appearance of wrinkles. The anti-ageing formula leaves skin smooth, radiant and noticeable youthful. Water (Aqua), Decyl Glucoside, Sodium Lauroyl Lactylate, Glycol Stearate, Glycerin, Butyrospermum Parkii (Shea) Butter*♥, Fragrance (Parfum), Caprylyl Glycol, Guar Hydroxypropyltrimonium Chloride, Sodium Methyl Cocoyl Taurate, Citric Acid, Aloe Barbadensis Leaf Juice, Caprylhydroxamic Acid, Sodium Chloride, Panthenol, Sodium Phytate, Tocopherol, Glycine Soja (Soybean) Oil, Daucus Carota Sativa (Carrot) Seed Oil, Caramel, Argania Spinosa Kernel Oil, Boswellia Serrata Extract, Commiphora Myrrha Resin Extract, Elaeis Guineensis (Palm) Oil, Euterpe Oleracea Fruit Extract, Soymilk Powder, Cocos Nucifera (Coconut) Oil, Mangifera Indica (Mango) Seed Butter, Calendula Officinalis Flower Extract, Butylphenyl Methylpropional, Linalool.